The Facts About Glyphosate, Part 4: Why does USDA collect farm data? This blog is the fourth in a five-part series titled “The Facts About Glyphosate,” sharing the facts about glyphosate and its use in the wheat industry. The United States Department of Agriculture (USDA), established by President Lincoln in 1862, is responsible for developing and executing federal government policy on farming, agriculture, forestry and food. Among other things, it aims to meet the needs of farmers and ranchers, promote agricultural production, work to assure food safety, protect natural resources and end hunger in the U.S. The USDA plays a very important role for the people of the United States. As part of its duty to protect our natural resources and ensure a safe food supply, the USDA monitors the application of all pesticides used in the production of our food. It collects information directly from growers, who participate voluntarily and on a confidential basis. The data is fact based and report actual chemical use. All farmers benefit when public and private organizations rely on this accurate, timely data in making decisions about health, environment, safety, trade and other critical issues. Having the data allows the USDA to evaluate the safety of the nation’s food supply, assess risks and benefits, make decisions about product registrations, quantify the benefits of conservation practices, and to market commodities internationally. For wheat, surveys have been done in 2000, 2004, 2006, 2009, 2012 and the next one is scheduled this year, 2017. The data from these surveys include herbicides like glyphosate. The USDA’s survey does not separate applications of any pesticide by when it was applied nor the rate applied. Because of this, it does not allow calculations of the percentage of acres treated. The survey data does show an increase in the overall use of glyphosate on wheat across the years surveyed. Over this time period, wheat growers in the semi-arid Great Plains region of the U.S. have been relying more on no-till production methods in order to conserve soil moisture and reduce soil loss due to erosion. The percentage of wheat acres managed as no till with an additional rotation crop has increased from less than 5 percent to more than 20 percent of total acres in both the northern and central Great Plains since 1989 (Hansen et al., 2012). This no-till practice adoption by growers explains the increased use of glyphosate, in that it is used in place of tillage. Very little is applied to the wheat crop itself, but is applied to the field that will be used for wheat production. While the USDA data for glyphosate is useful, it does not determine the purpose of the application. The survey is not designed for this much detail. The data is designed for one purpose but cannot be used for something else. If the survey was designed to obtain more specific information, it would be very lengthy and would reduce the participation in its completion. For detailed information on glyphosate use by wheat growers in the U.S., the industry relies on GfK, an independent consumer research firm. GfK is hired to collect data every year and details wheat growers’ agronomic practices. Figure 1 presents application timing for wheat acres receiving a glyphosate application. From the data, the majority of U.S. wheat acres do not receive any glyphosate application. 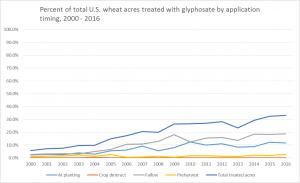 Even though glyphosate applications have increased over time, only 33 percent of all wheat acres receive glyphosate applications. To summarize, the USDA surveys U.S. wheat growers about their agronomic practices involving pesticide use, including the use of herbicides such as glyphosate. The data shows that glyphosate use has increased over time, replacing tillage and other herbicides. Without any scientific basis, some groups have mischaracterized this information to claim that U.S. wheat growers commonly “douse” their crop with glyphosate just prior to harvest, resulting in extremely high glyphosate residues on products made from wheat. The U.S. wheat grower argues this is simply not true and there is data to support it. Wheat growers are focused on using available technology to provide safe, abundant, and high-quality wheat supply.